Last week I was inspired to impulse buy a whole chicken. 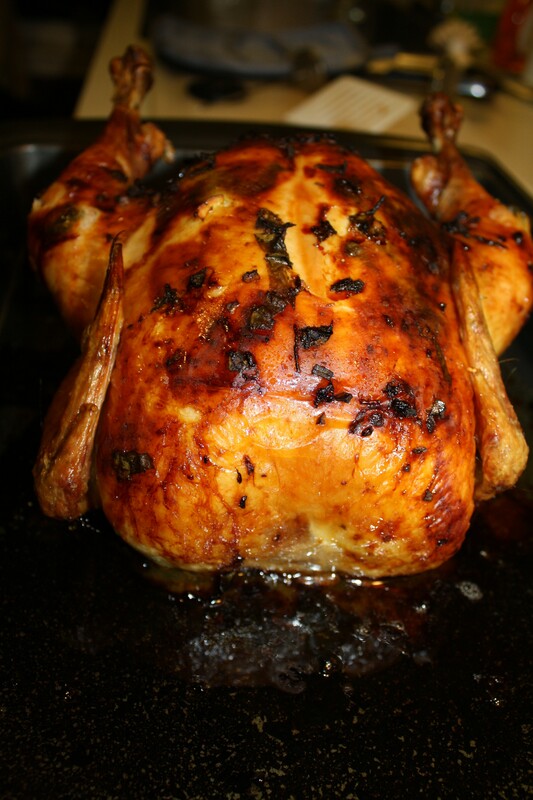 When I got home from the grocery store with my 5lb, free range, whole chicken, I realized that I wasn’t sure if I could handle it. I’m a former vegetarian who, thus far, has only cooked meat without bones and definitely without skin. I decided to make this chicken as simple and non-invasive as possible. 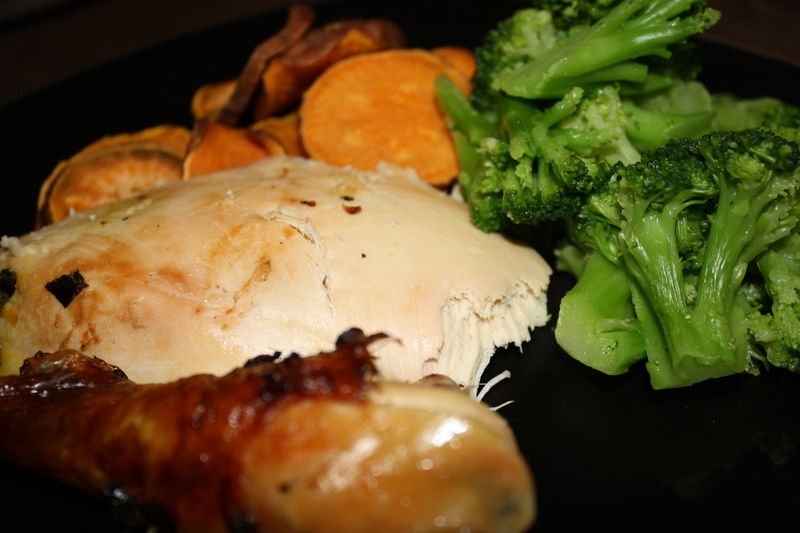 Coach Jaffney over at Crossfit H2O suggested stuffing the chicken with citrus fruit, which sounded easy and delicious. I decided to take her advice and add some fresh herbs and that’s how my citrus herb chicken was born. 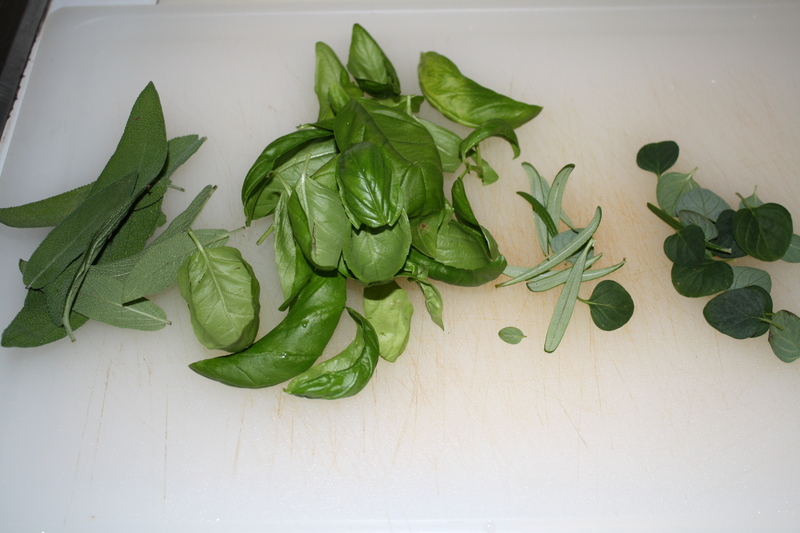 I used fresh herbs from my tiny garden, and from my upstairs neighbor’s garden. 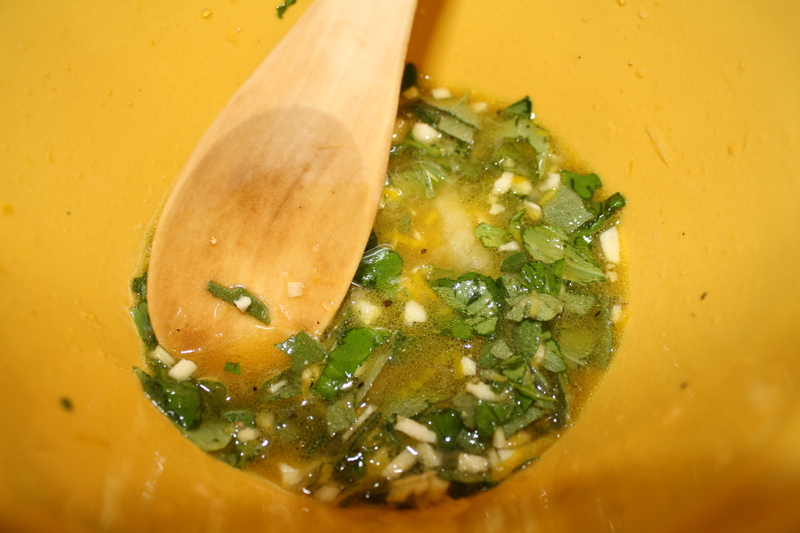 First, I chopped half of the herbs and placed them in a bowl along with the minced garlic, salt, pepper, and olive oil. 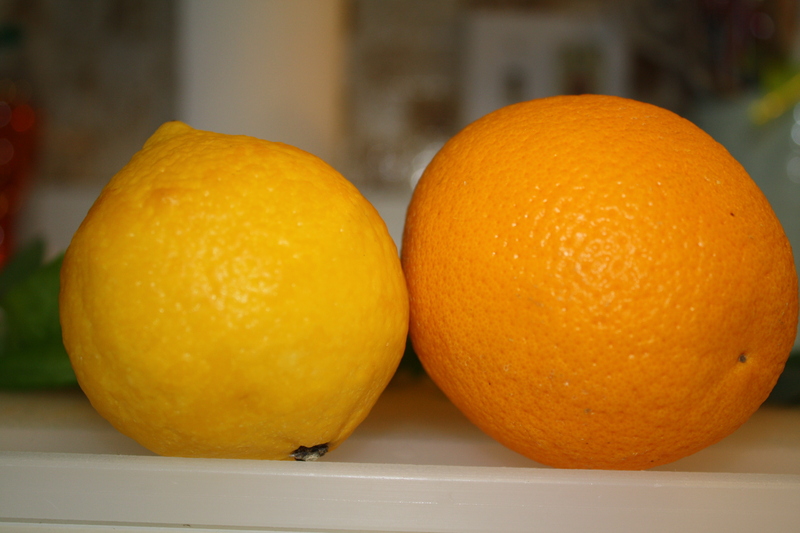 I added the zest and juice of the lemon, and the juice of one orange. 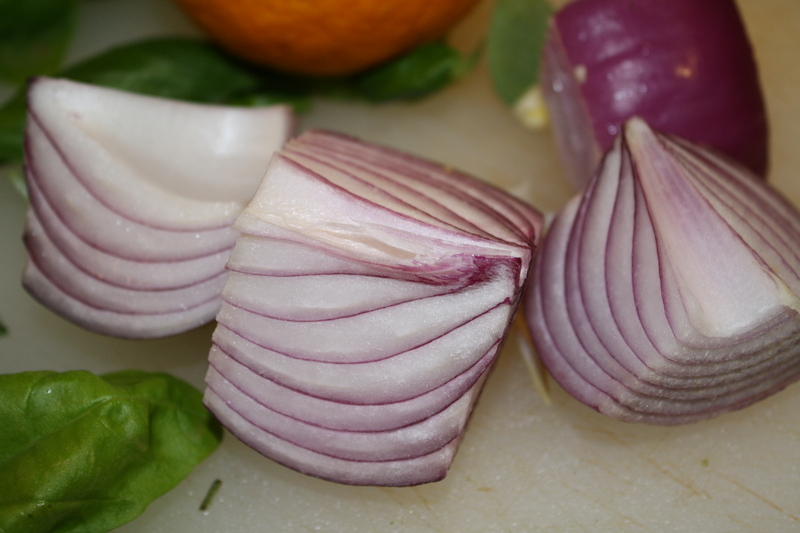 Then I quartered the red onion, and pierced the remaining orange all over with a fork. These, along with the remaining herbs are for stuffing the chicken. 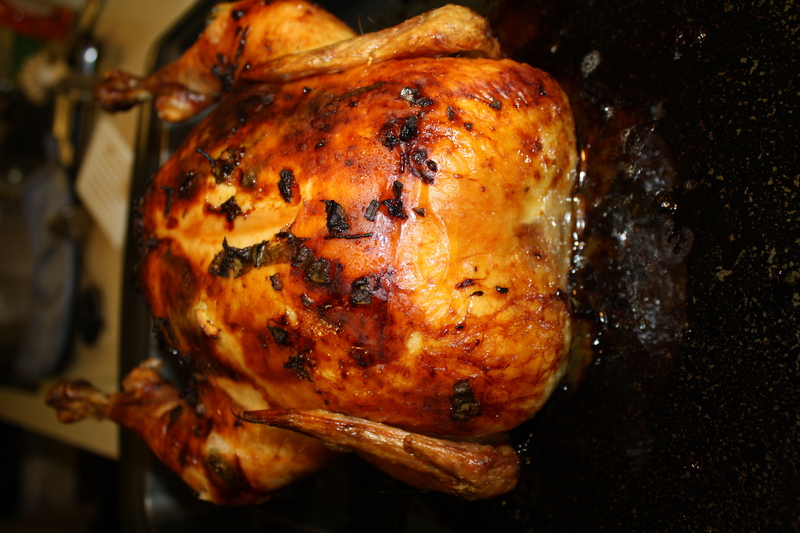 I patted the chicken dry, and placed breast side up in a roasting pan. After placing the bird in the pan, I loosened the skin with my fingers and stuffed some the citrus herb mixture between the skin and the meat making sure to cover as much of the chicken as possible. I poured the rest of the mixture over the chicken. 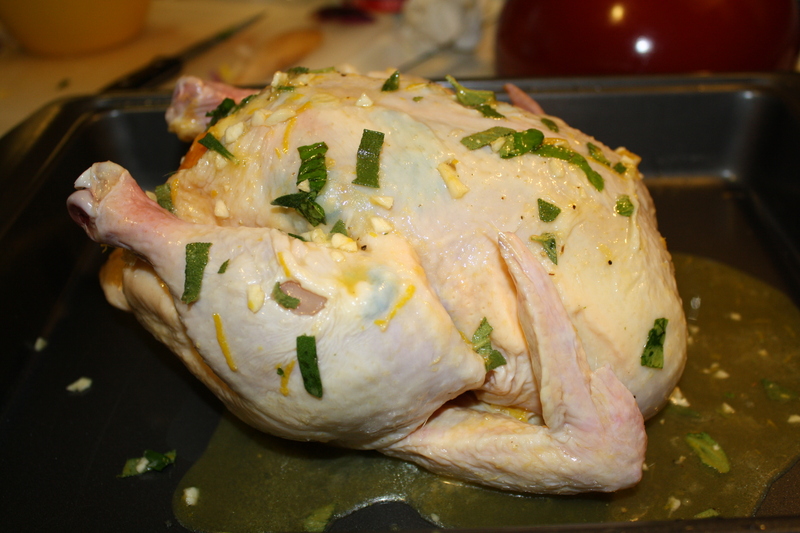 Before putting it in the oven, I stuffed the remaining herbs, onion and the second orange inside the chicken. 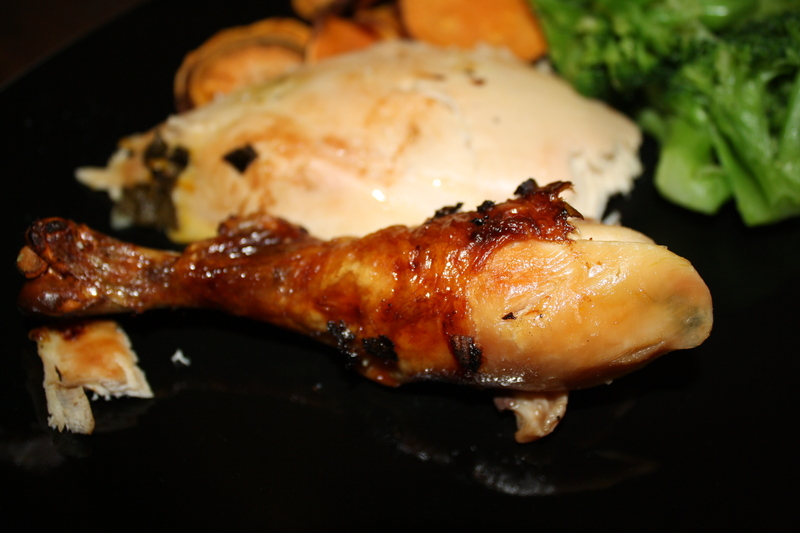 Then, I placed the chicken in the oven at 400 F for about 1 1/2 hrs–until a meat thermometer inserted into the thickest part of the thigh(without hitting the bone) read 175 F. The whole apartment was filled with the smell of garlic and herbs. Yum. 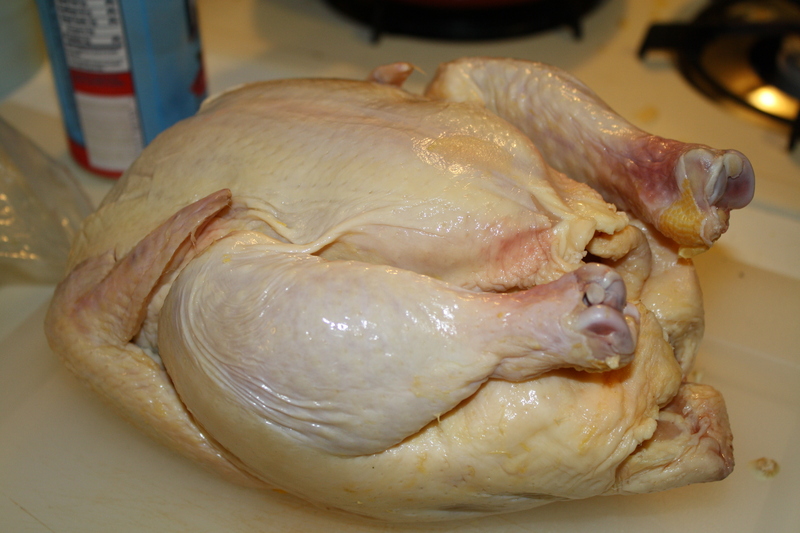 We let the chicken cool for about 10 minutes, and then M carved her up. The meat was perfectly juicy and tasted pretty darn good! I love the mix of white meat and dark meat! 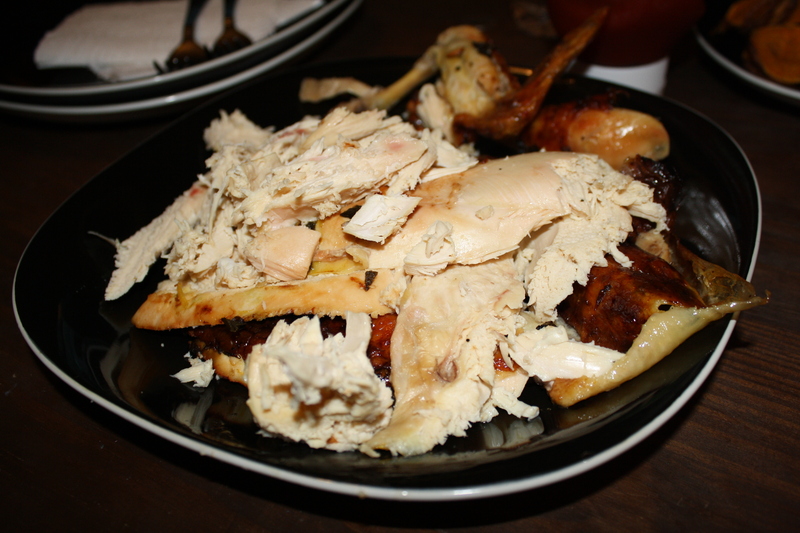 Over all the chicken was really good! I would definitely do this again. 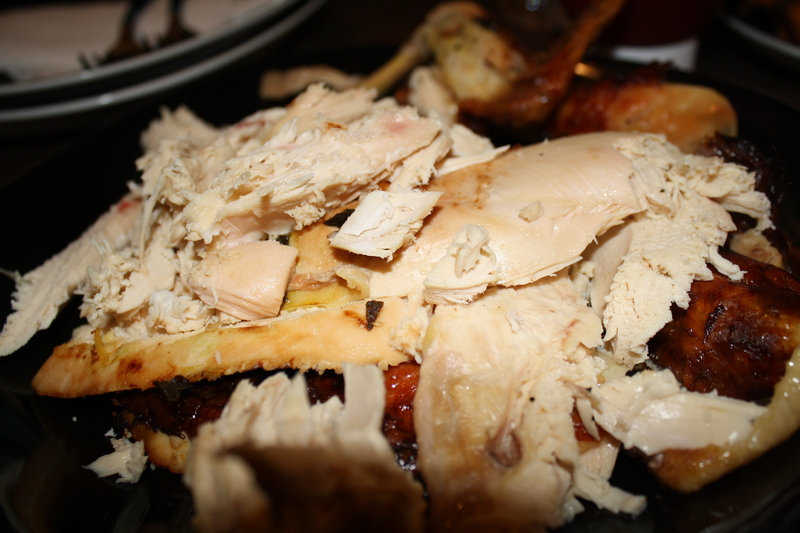 For me, the scariest part of preparing this chicken was loosening the skin with my fingers. It was weird, but I got over it. Now that I have one bird under my belt, I feel there are many more to come! 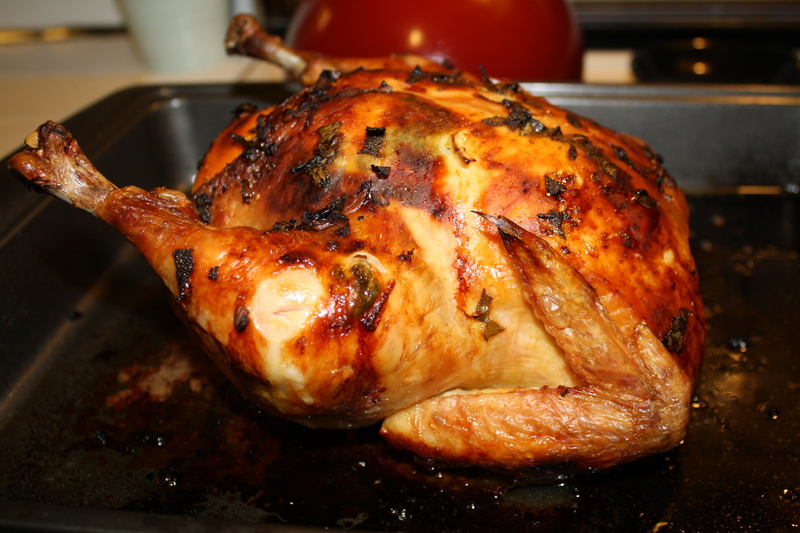 Although I think I’ll stick with chicken and smaller birds for now…and leave the bigger birds to the pros.